Less than 2 Million to buy, 5 Million to sell, take away 700,000 sales costs per 5 Million. That's at least 6 Million profit per hour just for 3 cars, and you can sell 20 cars if you want. So you can make a fortune! You don't need to be an artist either, just download someone else's designs, and put them on cars. In a sour mood in regards to routecomp2, So I am just gonna put this here as reference to spamming a topic in an attempt to get people to buy your overpriced car and vain attempt at a pyramid scheme. Nobody says anything about profiting in the auction house. Now.... lets try out this report button. Classic scamming. If you don't have the legendary ranking, you cannot place the big buyouts and will never make what you invest. More befitting of Jita 4-4. Try there. I don't have legendary status, they are the regular prices of the cars in the picture. In fact I didn't raise them up too high so that the cars would sell more easily. You can easily check yourself, you can raise them up to 9 Million, but I didn't, they wouldn't sell at 9 Million. The skill is in getting the price right. So you can sell them at my prices, you can also look how much you can buy them for quite easily. I bought them for 1.7 Million. That's a big profit, and no legendary status. Basically you are reporting me for making a profit in the auction, and telling people how to do it. No, it was just because this post had been made by yourself before in the shared link was all and in the current mood, I am dubious of the honesty of people so tend to find alterior motives that may or may not exist. So if this was an honest attempt to share tips, I apologize for that. But presentation is a big part of my skepticism. Perhaps is something with regional dialect? I do not know. It is the opener of "for those saying you cannot make money" which hasn't been a complaint I have seen. Only the complaint about buyout prices being limited if not of a rating. But then it comes with sharing a barn find. My views also are tweaked a bit after many years in eve online which is what the Jita 4-4 references. That is the main trading hub of eve. The buy this sell this is a common scam where peeps create a false interest in a good so people looking for a quick buck buy in on something that really has a limited value or resale ability. Often times working with a short term market control until purchases drop off and then they let walk away. Get rich quick schemes only work in most every time for the one who thinks it up. They then share it when the market is saturated for the gullible who then buy up the remaining asset of the one sharing their idea who get off clear of any negative assets and leave the ones they share it with footing the bills. It's just a game with an auction in it that's part of the game, it's not real money you know. Oh, good. I thought I was going mad or something. I only put cars up for auction when I have duplicates. I put them up for the suggested minimums (opening bid and buyouts) so someone can get a bargain. If they don't sell, no big deal. I just delete them. I only up the price on the rarest cars, and even then it's only by a small margin, I feel better earning credits actually playing the game and not ripping people off. Some people hoard credits in these games even after obtaining every purchasable car to the point of being able to buy everything in the game multiple times, and then still keep ripping people off by painting a car with an ugly garbage livery and cranking the price up to 20 mill when they are sitting on the credit cap. You can't rip people off in an auction, but you can insult people in a thread. What I thought the title was trying to say was: You don't need legendary status to make money in the AH. That was the apparent point of the post, or at least the "trying to be helpful" component. As opposed to the "I just made 15 mil!" component. Maybe not the most artful way of titling it, but I feel like I've heard complaining about the huge markups legendary painters can throw out there and it's not that long a walk to think that at least some of those people feel like the AH doesn't work for them. It made sense to me. ... although I just remove cars I don't want, I think a lot of people like to be able to get a fraction of the sticker price in the AH instead of nothing. And others like buying for a fraction. The strategy in the OP is basically this. Yeah, it's a barn find, but it has a value and 5 mil was a fraction. And somebody on the other end agreed. Nobody had a gun to their head. It wasn't a scam, it was capitalism. That's the AH being used as intended, and, yes, anyone can make money doing legitimate business in the AH, regardless of status. I don't think some of the reactions were warranted. if it was up to me i'd get rid of this "painter privilege" stuff and hae the bonus of uploading good paints and tunes simply being a better payout per download/use/like. I dont know why they need to let a small selection of the playerbase essentially scam other users by sniping cars then reselling at 10x the price just cause. I don't agree with your definition of the auction house functionality for those with legendary status as a 'scam' or 'scammer mode'. Scams by definition are a fraudulent or dishonest scheme or swindle. That's not in any way what's going on here. The buyer knows exactly what they're getting and exactly what the price is. They are not being forced to buy it. Don't want the car at a 20M credit price .... don't buy it. Simple as that. Knowing and accepting that one is being charged a dishonest amount under an unfair practice doesn't change the dishonesty or unfairness. But, hey, call it a "legitimate business" if you like. You can look at the other car prices, and compare, you aren't blind in the auction house. I was going to pay 20 Million for the new Honda Civic 18, but I got it cheaper. I don't know why some would willingly pay this much just for liveries that you can easily get for free, assuming you already have the cars of course. 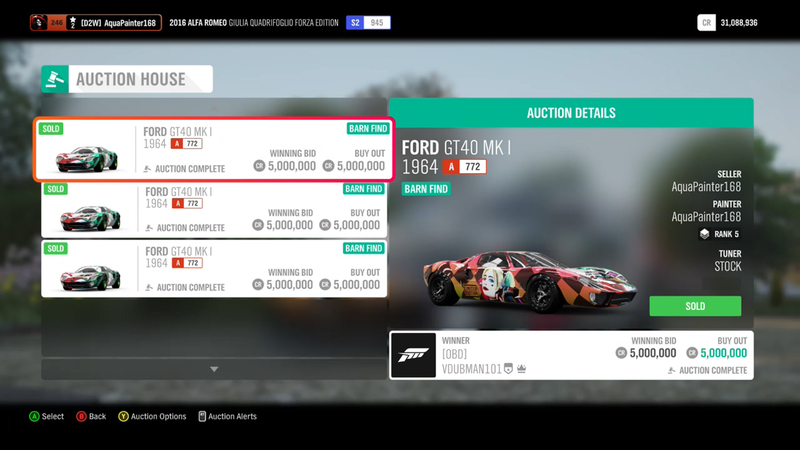 Also I wouldn't say you can't make a huge profit in auction house but it's pretty much dependent on luck if you aren't selling the rarest vehicles. I don't put those liveries on my Hub, the ones on my hub are different colours. You get a limited edition car which is what you pay for. But generally you don't have time to look on a hub for a paint job when the auction is about to end, so you buy the designs anyway. Not all liveries are shared, some are only available via auction. Also, nobody really spends their last 20 mil credits they were saving over a few months on VW Golf. But one needs to do something with surplus money and why not by treating yourself with the car you want in the livery you like? As for "much dependent on luck", well to some extent. But also on effort. I'm not legendary, I can't set 20 mil buyout. But another day I decided to get rid of Acura RSX (24k Cr) duplicate I (and everyone in the game seemingly) had. So I put a livery that is not shared on it, I added a good tune that I tested in a few races before (18k Cr) and put in on AH. If you look for RSX in AH, there's probably a few hundred offers for 5-7k at any given moment and most are not selling even for that price. I put 70k price on mine and it got sold after an hour. I apply the same principle to any car I sell in AH and they all go out significantly above their Autoshow price tag and none of them are rare (each is obtainable from the shop or AH easily). I don't do it for money either, just for fun of selling someone nice looking car with good tune at higher price than regular shop. Let's call it luck. But it might have something to do with effort. Yeah bro, we all know real-world Ferrari's should be sold at Prius price tag, I personally would buy 3 for myself. Unfortunately the whole world is a scam like that. The two bits on the market side here. First is the legendary painter part. This is an example of intent vs result. The intent was people with a high fan base and quality liveries could instead of sharing it all over on something that is a bunch of work, they sell it locked to the car. Doing so keeping the art rare vs common. The buyer spending the premium to have a one off or limited line. Those of us talking scam, scam is what is said, but we mean market manipulation. Controlling a stock of vehicles so you set price. People can only set auction or a max buy price. They now buy and resell but dont even need a good livery. With market bots, it autobuys and then they come in and dump at more than anybody else could get. Yeah, not a scam, is just a bit dirty is all. The original seller is capped, and somebody who legitimately wants must pay a premium to a person with a stockpile making a big markup. Result is that anything with a limited supply isnt supply based pricing any more. This is made worse by the livery system itself. A person could make an amazing livery, but way it recommends doesnt let up and comers make in roads. First in, wins. That's one way of looking at it, but I see something else. Yes everything you said is true, but it doesn't work. If you raise the prices the cars do not sell, you make more money at lower prices. For example in this thread I use the Ford Gt 40 64 which will currently sell at about 2.3 Million. Last month it would sell at 900,000. But last month you would buy at 900,000 sell at 2 Million. This month you go from 2.3 million to 5 Million. You make more money now, but need to spend more money too. But here's the problem with your idea, the people trying to sell at 3 Million up to 20 Million aren't selling any cars. They are costing themselves money, where they could be doing the smart thing and going for the 5 Million payout. 5 Million is the current limit. legendary sellers can't up the price without costing themselves money over a few days. It doesn't work. You are better off doing what I do. At a later time, value goes up, so example is buying cheap the FE store cars that are not autoshow. Later value goes up and you sell. Market forcasting is a bit of an art. To some it will come natural. Combine with your own nice livery and indeed, it most definitely can be a fun and reasonable money earner. My earlier comments were because original posts do not present this idea, and gave off to me the presence of market manipulation. Combined with issues related to game that isnt relevant to this conversation, I was in a hostile mindset so approached this topic with a more malicious intent assuming mindset. I usually prefer civil and understanding conversations so I am sorry about that. While the way I said it may not have been interperated as feasable, it is. You buy cars cheap because a person cannot sell for more, then immediately repost at your maximum. People will buy because they want and it is only one on the market. Other sellers competing will minutely undercut. Giving you a rebuy at lower margin, but can maintain a net positive. This works until the supply builds up beyond demand at which time being aware of market is vital. When it no longer is feasable to maintain the monopoly, you flood the market with your supply to cover the asset value. By rotating stocks and staying ahead, it nets huge profits, but at the expense of the average player. And if supply and demand are balanced, with the game you can effectively force prices to always be at the maximum solely because there isnt any way for the supplier to offer a competitive price. This is where people get upset by the legendary. I do not have that status but have a car that can sell for say 20m. As result, I am forced to sell it for peanuts where said legendary status can just flip it instantly for a much higher value.